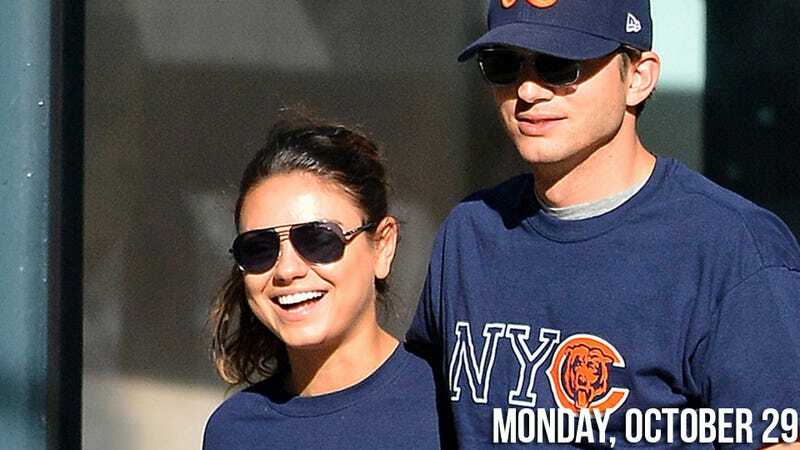 Today in unbaby news, after taking a stroll with Ashton Kutcher during which she displayed "significant roundness in the stomach area" over the weekend, Mila Kunis immediately got the baby-bump media treatment. Can we expect Ashmi spawn in the next 9 months?! What will they name her?! When will I get another job, and why can't I stop drinking, and should I put on pants?! exclaimed everyone. A few hours later, Kunis' spokeswoman came back with the unsurprising answer to the first question. As a citizen of Hurricane Sandy's Zone B, it makes me nervous that Lindsay Lohan is daring the gods of weather. She has taken to Twitter to alternately mock the Frankenstorm and attempt to soothe her fans.